On Saturday Robin launched his Fit as a Fiddle challenge in aid of Music in Hospitals and Care, Scotland. He played a range of fiddle tunes that he has composed to celebrate special occasions for family and friends. The video link is of Robin playing the tune, Palace Stores which he composed for the wedding of Caron and Ian of our own village store in Birsay, which is adjacent to Annie's Place, our Orkney self-catering apartment. 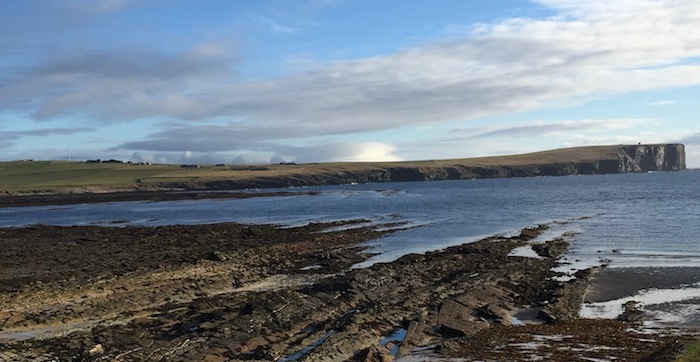 The first of Robin's seven Orkney walks (with fiddle tunes composed to commemorate each one) is planned for 13th of May when he will walk from Annie's Place, along the shoreline of Birsay Bay, to the viewpoint of Marwick Head. The photo below shows his route. His Orcadian companion on this venture will be Lesley Burgher, Chair of St Magnus Festival. Watch out for posts of all seven walks on FaceBook and Twitter as well as on this Blog!